MACOMB, IL  The air spade was originally developed by the military to clear land mines. But it has a far less ominous use by landscapers, urban foresters and groundsworkers, and Western Illinois University agriculture students and Physical Plant employees got to see that use firsthand. 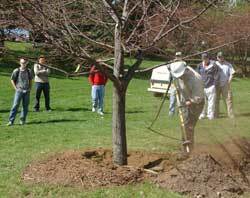 Western alumnus Dave Baker and Dave Boone of Bartlett Tree Experts Company visited the WIU campus April 8 to demonstrate the use of soil excavation using an air spade. According to Western agriculture associate professor Tom Green, the air spade has great application blowing soil away from a trees base without harming the roots. After soil is excavated, compost and mulch are used to replace the soil. 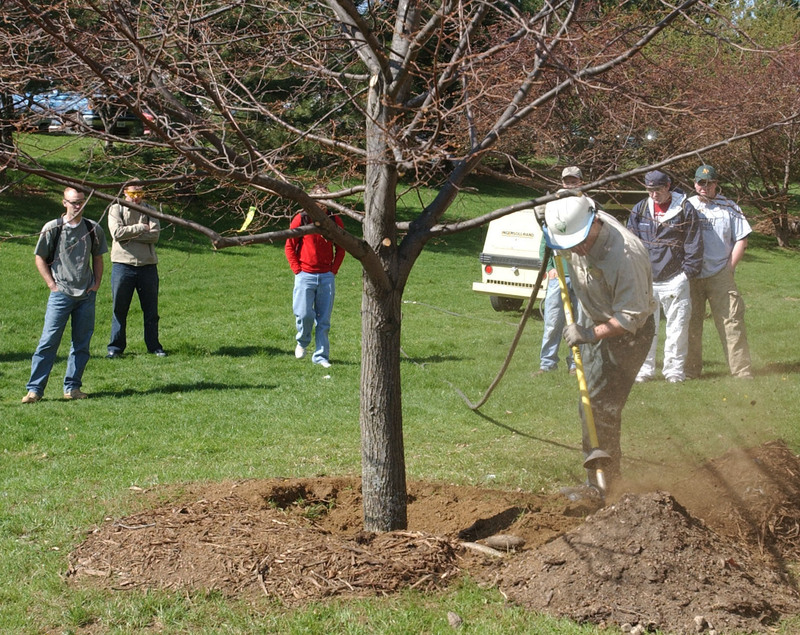 Westerns Physical Plant provided the air compressor and mulch used around the trees for demonstration. We also allowed some of our forestry students to run the air spade to gain hands-on experience, Green added. In addition to providing agriculture students with applicable training skills, Bartlett Tree Experts Company also provides an annual $2,000 scholarship to Western forestry students. *EDITOR'S NOTE: A quality photo of the air spade demo can be downloaded at www.wiu.edu/news.